What is New York City Times Square Ball? The Times Square Ball is a time ball located in New York City’s Times Square. 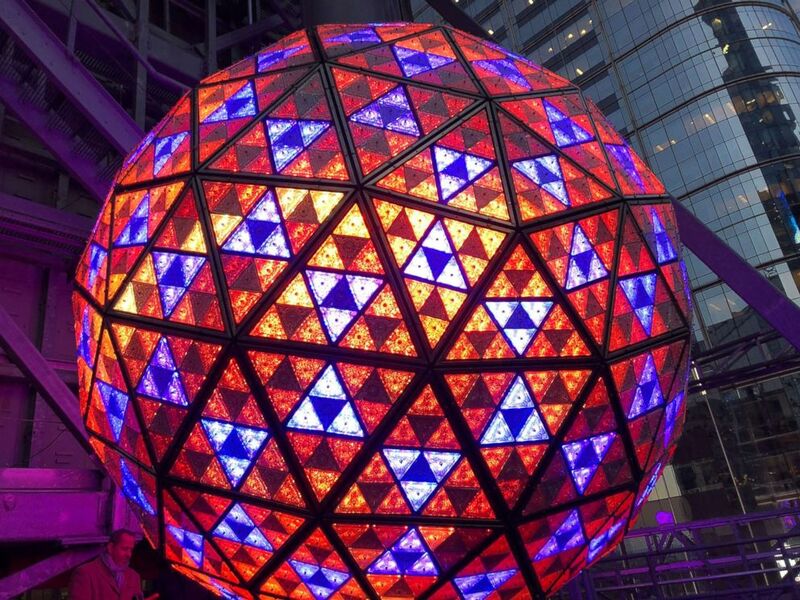 Each year, millions of eyes from all over the world are focused on the sparkling Waterford Crystal Times Square New Year’s Eve Ball. At 11:59 p.m., the Ball begins its descent as millions of voices unite to countdown the final seconds of the year, and celebrate the beginning of a new year full of hopes, challenges, changes and dreams. The Ball is covered with a total of 2,688 Waterford Crystal triangles that vary in size, and range in length from 4 ¾ inches to 5 ¾ inches per side. For Times Square 2019, 192 Waterford Crystal triangles introduce the new Gift of Harmony design of small rosette cuts flowing into each other in beautiful harmony. 288 are the Gift of Serenity design of butterflies flying peacefully above a crystal meadow, capturing the spirit of serenity. 288 are the Gift of Kindness design, consisting of a circle of rosettes symbolizing unity with the fronds reaching out in an expression of kindness. 288 are the Gift Of Wonder design composed by a faceted starburst, inspiring our sense of wonder. 288 are the Gift of Fortitude design of diamond cuts on either side of a crystal pillar to represent the inner attributes of resolve, courage, and spirit necessary to triumph over adversity. The remaining 1,248 triangles are the Gift of Imagination design with a series of intricate wedge cuts that are mirrored reflections of each other, inspiring our imagination. The Ball is illuminated by 32,256 LEDs (light emitting diodes). Each LED module contains 48 LEDs — 12 red, 12 blue, 12 green, and 12 white for a total of 8,064 of each color.